Take Exit #249D ( North Avenue). At the top of the exit ramp, turn right onto North Avenue. Cross Techwood Drive (the first light) and pass the football stadium on your right and the alumni house on your left. After driving underneath the overhead foot bridge, turn left into the Area #1 Parking lot, which is labeled with a yellow sign. At the end of the exit ramp, proceed through the first intersection. At the next intersection, turn left. Continue on West Peachtree for one block. Cross over the Interstate and Techwood Drive. Pass the football stadium on your right and the alumni house on your left. 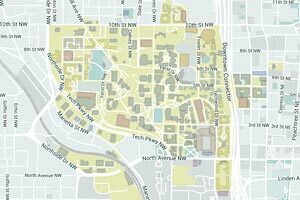 Cab: Take a cab through downtown Atlanta to the Georgia Tech Campus. 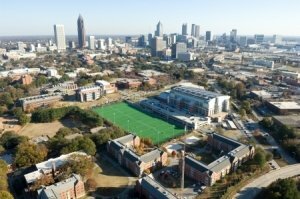 The Bill Moore Student Success Center is located on North Avenue (225 North Avenue, Atlanta 30332) next to the Bobby Dodd Football Stadium. Cab fare is approximately $30. For pick-up from the Student Success Center, you can call Checkers Cab Service at 404-351-1111 and ask them to pick you up at 631 Cherry Street or 190 North Avenue. 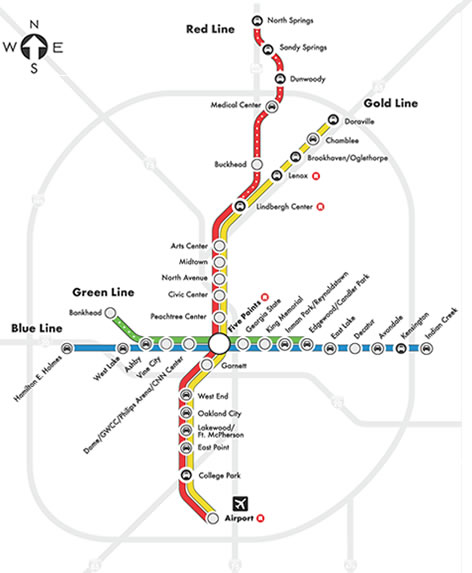 From the airport take either northbound line (Doraville or North Springs) to the North Avenue Station. At the intersection of North Avenue and Fowler Street, ascend the stairs under the archway and take an immediate right. Follow the path to the Student Success Center. The walking distance from the North Avenue station to our office is approximately ½ mile. For any additional schedules or bus routes, visit http://www.itsmarta.com.